Nooitgedacht Ponies are one of the few indigenous breeds in South Africa, and the only true descendant of the better-known Basuto Pony. Nooigedachts are a rare horse breed, with only about 400 purebreds in existence. 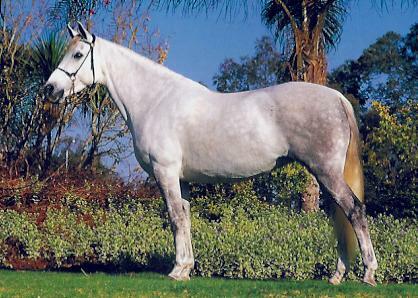 Their development began in 1951 when the South African Department of Agriculture brought a group of Basuto-type ponies. In 1952 a breeding project began on the Nooitgedacht Research Station. This was done primarily to save the famous Basuto horses from extinction but also because South Africa needed an indigenous farm and riding horse adapted to conditions of the region. Systematic breeding resulted in the gradual crystallization of a recognizable and uniform type, and breeders were able to start talking about a "breed". In 1967, breeding stock of these horses were supplied to eight studs, and they were established as part of the project. According to the standards set by the Nooitgedacht Breeders' Association, the Nooitgedacht pony should ideally be a good riding horse with outstanding stamina. They have a compact build, with a short back, and a well-sloping shoulder. They are good natured and intelligent. They are extremely hardy with good bone structure, good joints, and excellent hooves which seldom require shoeing. Bay, brown (a variant of bay) and chestnut roans are the most common colous. They usually stands between 13.2 (138 cm) and 15 (153 cm) hands high. Nooitgedacht ponies are tall enough to be used by both children and adults. They are good jumpers, and they are becoming more popular as a show horse. They excel in gymkhana, polo, endurance riding, and hacking.